Society is cracking. Lurching from economic disaster to social decay, our modern-day life is plagued by sickness. 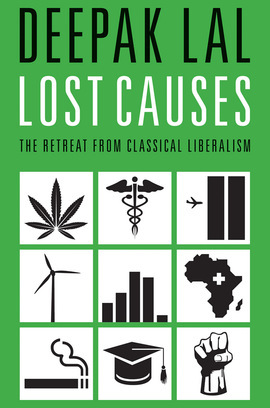 Deepak Lal, world-renowned economist, tackles the hidden roots of our problems in his visionary book Lost Causes. Providing a completely new framework for socio-economic understanding, Lal challenges received wisdom with a sure voice and shows how those in power have forgotten to take care of some of the fundamentals of everyday life. From a faltering NHS to the war on drugs, Lal reveals to the world the lost causes in its current malaise. The world’s pre-eminent development economist, Deepak Lal is the James S. Coleman Professor Emeritus of International Development Studies at the University of California at Los Angeles, and Professor Emeritus of Political Economy, University College London. He is past President of the Mont Pelerin Society and the author of many works including the widely acclaimed and highly influential The Poverty of Development Economics.